There is something about the Magic Kingdom Fireworks and show that cannot be topped. My family and I are fortunate to have Annual Passes and, no matter what, we never miss the show. We have seen the show from every angle, every land, in every season and every situation. 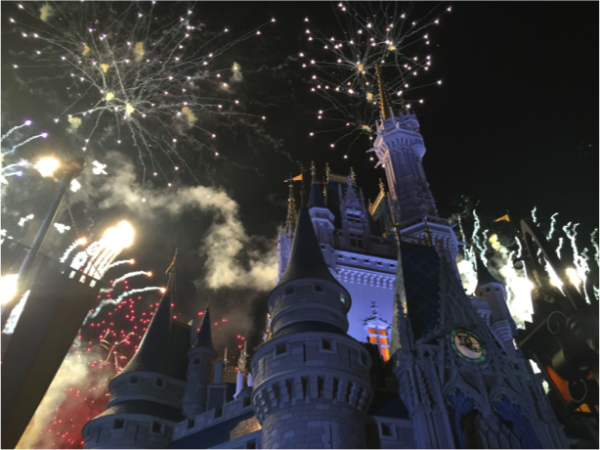 From New Years Eve to Christmas Day, I’m going to share with you my top-spots and give you the inside track to Magic Kingdom Fireworks Nighttime Spectacular. Many people visit Disney World when they are pregnant or with infants and toddlers. 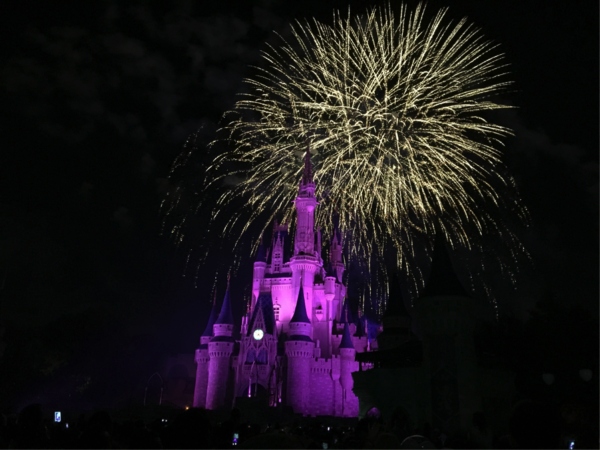 Sometimes these are planned visits and sometimes a “special-surprise.” My wife and I visited Magic Kingdom on July 4th while she was five months pregnant with our daughter. When our daughter was born, we ramped up the Disney Trips and have now been for New Years, Christmas, Halloween and Memorial Day all from when she was five months to 2.5 years old. We are professional Disney parents, to say the least. The one thing that has made those tough situations easier is the Baby Care Centers located in all the parks. The Magic Kingdom gives moms (and Dads) a place to escape the crowds, nurse, and watch the fireworks. Tucked just between Casey’s Corner and The Crystal Palace, the fireworks can be enjoyed without the stress of bumping into people and navigating through some pretty chaotic situations. If you are planning on visiting during the holidays, or any other time, with your little Mickeys and Minnies, rest assured knowing there is a quiet place that provides great photo ops and stress free viewing of the fireworks show. Pros: Close to child-care, a great place to escape, awesome photos. Cons: Increased waistline – the smell of chilidogs are too much to resist. If you are looking to get away from the crowds and share a romantic moment, or just plain experience something breath-taking, grab yourself an Advanced Dinning Reservations at the California Grill located on the 15th floor of Disney’s Contemporary Resort. This spot will give you an unmatched vantage point: 150 feet up and about half a mile from the Magic Kingdom. For my money, July 4th is the best time to snag this spot. 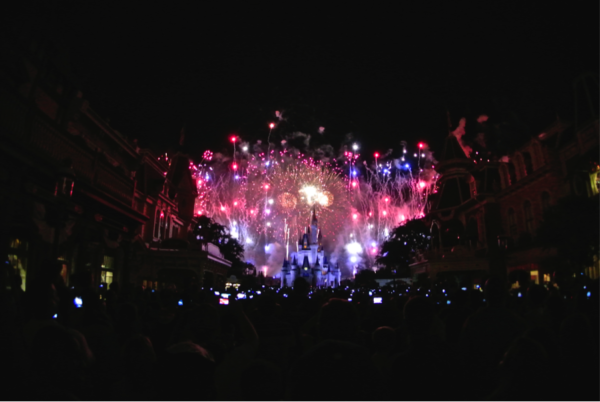 Magic Kingdom celebrates Independence Day with a special 360-degree mega-fireworks display called “A Fourth of July Concert in the Sky”. While being in the center of Main Street USA is great, you can’t possibly take it all in; but from high atop the Contemporary Tower, it’s a spectacle to behold! 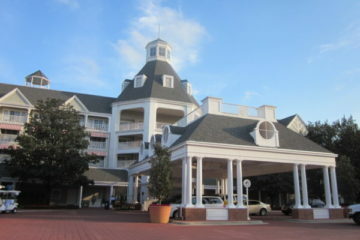 Perhaps the best part about this hidden location is you don’t have to be staying at the Contemporary Resort to partake. Simply book a dinning reservation about one hour earlier than the scheduled show time and you are all set. Pros: Virtually no crowds, romantic, indoors and breath-taking. Cons: Away from the “spirit” of Magic Kingdom. For me, this location is great for a romantic escape with your partner, but it comes at a price, literally. Monetary costs aside, you’ll still a need to line up at least 15-30 minutes before the entry time. The deserts are awesome, though in your mind you’ll think, “I’m gonna gorge,” in reality you will likely only have a few bites and then settle in for the show. Being that this is one of the most difficult reservations to snag, do try if you are celebrating an anniversary or have a sweet tooth. Pros: Romantic, sweet, great photos. Cons: Tough to reserve, pricey, overrated. My family and I recently stumbled upon something that I can only say was pure luck: watching the fireworks from inside the Cinderella’s Castle. To do this, you’ll first need a reservation for dinner at Cinderella’s Royal Table, which can only be done by calling Disney Dining. Be sure to call 120 days out and consult with your Disney Dining representative and let them know you want to watch the fireworks. The view of the fireworks from inside Cinderella Castle is amazing! Next, and here’s the neat part, when the fireworks begin, watch the first part from within the castle, then exit the dining hall and go outside. During the fireworks, the castle and it’s surrounding areas are closed off, giving you and a small group of guests the chance to actually walk out onto the front terrace and see thousands of people staring at the show. I told my daughter that all of the guests were there to see her because she is a princess. Turn around and you are looking straight up at the fireworks as they ignite just above Cinderella Castle. You can also go to the back of the castle. Though you won’t see any of the fireworks, you will see something that is equally rare, an empty park, or so it seems, as this area is also closed off during the show. 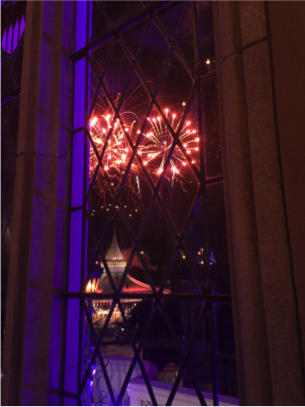 The only thing better than watching the fireworks from inside is seeing them from right underneath the castle! If only you could watch the fireworks Nighttime Spectacular from the sky! Oh wait, you can. From Elephants and Rockets to Balloons and Helicopters, being high in the skies can give you something to tell your friends about. For starters, book a FastPass for Dumbo the Flying Elepaht or Astro Orbiter within the same hour as the fireworks. While the rides are short, you can snag some pretty cool pics and ride a classic at the same time! Pros: Unique, private, and wow! Cons: Timing is everything, unpredictable weather, expensive. Just rock’s throw away from Cinderella Castle at the entrance to Liberty Square you will find the Sleepy Hallow snack bar. This is a great place to watch the fireworks while enjoying, one of my favorites, a funnel cake covered in strawberries and chocolate syrup. This is a unique place to watch the fireworks as it’s off to the side of the castle, giving you a different vantage point to enjoy. Cons: Can be slightly obstructed if people stand in the perimeter path to the castle. 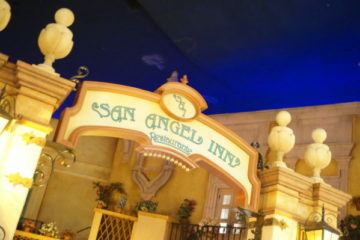 For those out there who want to be in the action, grab a spot on Main Street USA about thirty minutes before the show. Many guests like this location because it promises great photos of Cinderella Castle and the fireworks. The smell of fresh coffee and cookies fills the air and, perhaps best of all, snow falls each night during the Christmas season all along Main Street. This is the best place to snap that iconic photo of the castle. Try putting a fisheye lens on your camera for a truly epic shot. The view of Cinderella Castle from Main Street USA is just as Walt envisioned: perfect! 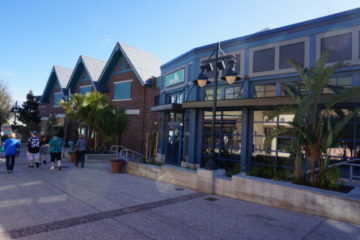 Pros: Close to Starbucks and food, quick access to shopping, the perfect photo spot. Cons: Standing room only, lots of people, stuck in the mass exodus. 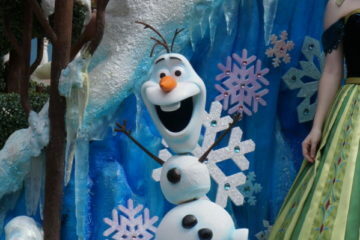 The holidays at Magic Kingdom are full of seasonal spirit, holiday treats and loads of people. Any holiday is considered, by many, as avoid-at-all-costs days. I, disagree. If you don’t have a reservation for the dessert party or access to reserved seating, there are five locations in Magic Kingdom that provide smart guests with a great viewing, relief from crowds, and fast access to exiting the park or giving you a quick return to popular attractions. Behind Prince Charming’s Regal Carousel is a perfect place to watch the fireworks from the backside of the castle. If you are visiting during the holidays, this area is often converted to “one-way” traffic flows. Just duck in where all the strollers are parked and you’ll have some relief from the crowds while enjoying the show from a unique vantage point. While it may not give you that iconic picture, it does provide you quick access to some of the popular attractions following the show. Tomorrowland Terrace pass-through nook is my next top-spot. As you walk over the bridge into Tomorrowland there is a small nook just past the rocks to the right. This area is on the fringe of the holiday crowds. After the show ends, many guest exit the park. Here, you are on the outside edge of the masses and therefore do not risk getting landlocked until the park clears out. The Tomorrowland Terrace offers excellent view of the castle with small crowds. In front of Tony’s Town Square Restaurant, you will find my third pick for watching the holiday fireworks. This spot gives you a great location and quick access out of the park through the high-capacity-cut-through. Disney often opens this pathway on busy days to relieve the bottleneck on Main Street. If you are looking for the best location and want to be the first to exit the park, this secret spot is perfect for you the Main Street Railroad Station Platform. 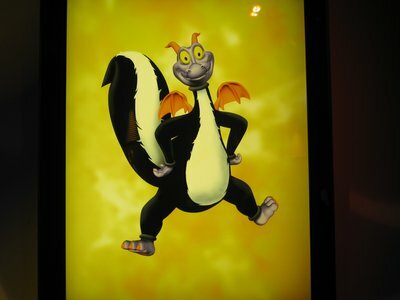 Located at the front entrance to the park, step upstairs to the station platform and enjoy the show. Elevated above the crowds, you can get a birds eye view directly down Main Street U.S.A. right to the castle. Best of all, as soon as the fireworks end you’ll be one of the first out of the park beating the mass exodus. Lastly, at the center of the Magic Kingdom hub stands a statue of Walt Disney and Mickey Mouse. This statue captures the spirit of Walt Disney and all that he dreamed. It is the quintessential spot to view the fireworks. While the crowds may be heavy toward the front of the castle, this spot is usually pretty open. 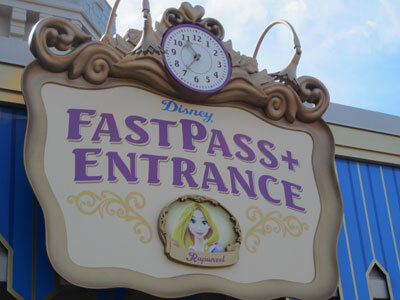 This is due to the hub path that must remain open for guests to pass freely from Liberty Square to Tomorrowland. If you can, grab that spot right away and enjoy the show. There can’t be anything more iconic than viewing the fireworks with the Partners Statue in the foreground and the castle in the background. 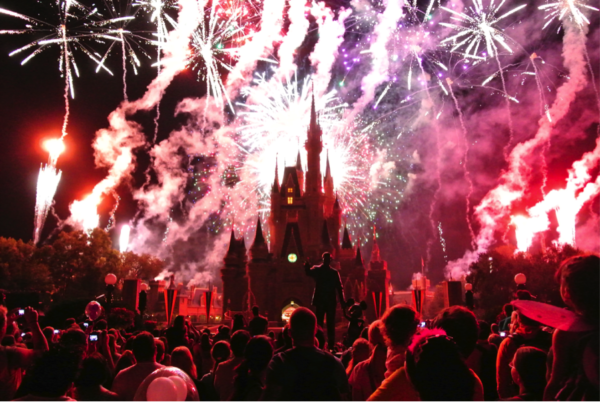 What is your favorite in-park spot to watch the Magic Kingdom fireworks?